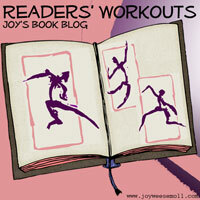 Welcome to Readers’ Workouts where bookish types get in touch with our athletic sides. Let’s cheer each other on to exercise success! My goals for July were 1400 minutes of exercise including 15 workouts with my Wii. In each week’s report, I’ve been ahead on one and behind on the other. So, I’m very proud today that I’m right on track to meet both goals! I had a lot of variety in the last week — a couple of good gardening sessions (one that involved hauling wood) and several Wii sessions. We’re back in a heat wave again, but if I get out early enough, I can still get my gardening work done. How was your week? What are your plans for the coming week? Post on your blog (feel free to grab the logo) and link below or simply join us in the comments. I like your idea of keeping track of the minutes exercised. I think I am going to borrow it for the upcoming week. Great job. Hauling wood is hard work. Getting back on track is the best feeling! I’m in the same boat today so I know how you feel 🙂 And oh, yes, the heat wave is back, which I can’t imagine hauling wood in it! Glad you can schedule it during cooler hours, that’s for sure. I’ve had a good week – managed to increase my furthest distance ever run. We have a heat wave here… shouldn’t complain after the dreadful load of rain we’ve been having I suppose. Variety is a great thing to keep you motivated — great job this week! Nice going!! I’ve been slacking off lately so reading your post has motivated me to “get back in the groove.” For me the key is getting up very early or I miss the window of opportunity.